Part 2 – After August 10, No Crop Formations Except in Canada? August 29, 2003 Philadelphia, Pennsylvania – As I had reported on Coast to Coast AM and Dreamland Online back in June, after the crop formation appeared in Belgium on June 24, 2003 that was very similar to the Gog Magog Hills “angel” formation of July 25, 2001, that came 49 days before the September 11th Al Qaeda attacks on the United States, many wondered if the 2003 Belgium pattern meant that 49 days later on August 11, 2003, something else serious might happen – either in the crop formations or a world event. 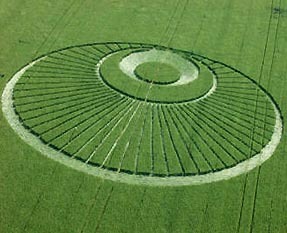 Above, crop formation reported June 24, 2003, in Mielen-Boven-Aalst (Gingelom), Belgium. Very similar to the Gog Magog Hills “angel” formation below discovered July 25, 2001, southeast of Cambridge, Cambridgeshire, England. “Disturbing humming sound” was reported by people living near the field in Belgium. So, on August 10, many of us were trying to decide where we should do night watches that night and on August 11th when cell phones began to ring announcing the discovery of a new, large formation. It was 750 feet in diameter in wheat between Morgan’s Hill and Cherhill Down directly east of the four burial mounds and 11-concentric-ring formation that had astonished everyone back on July 6 in North Down. From the air, the new pattern contained 61 circles that alternated dark and light: the light was flattened crop and the dark was standing. The circles created a 3-dimensional object that had three branches that resembled a hexagonal-structured molecule. Large “molecule” formation reported August 10, 2003, spanning approximately 750 feet in a wheat field directly east of the July 6, 2003, 11-concentric-ring formation. 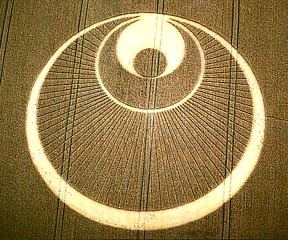 Aerial photograph © 2003 by Mark Fussell, cropcircleconnector. 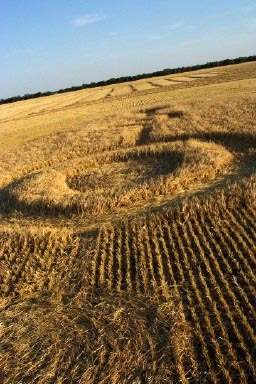 Since it was August 10th with at least five more days of the typical British crop circle season to go – everyone said the “molecule” could not be the last one. Another big one would certainly come down somewhere else in the Vale of Pewsey. 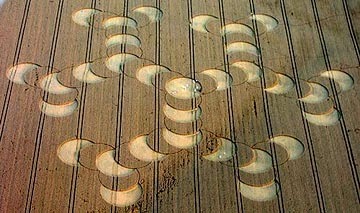 But now it is August 29th, and crop circle researchers are puzzled by the fact that not a single other formation was reported anywhere in England or Europe after August 10th. But after that date, crop patterns have been reported in Burlington, North Dakota near Minot, and Canada. Farmer Delos Haugen from Burlington, North Dakota near Minot, was running his swathing tractor in his barley field on August 11th when he ran right through the edge of a circle. He was so shocked to see his barley laid down flat and swirled so perfectly clockwise that he called his girlfriend, Donna (last name withheld at her request) to come see for herself. She road back out with Delos on the swather and talked to me this week about what they saw. 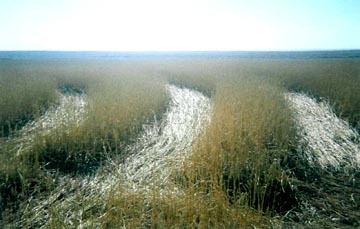 Pictogram in barley about 130 feet long on farm owned by Delos Haugen in Burlington near Minot, North Dakota. Photograph taken on August 11, 2003, from swathing machine by Donna. 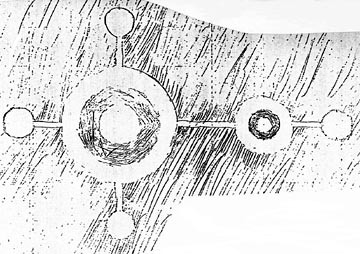 Diagram drawn by Stan Witteman from videotape taken by KXMC-TV (CBS), Minot, North Dakota. Donna (last name withheld at her request), Customer Service Rep., Minot, North Dakota: “We got off the tractor and looked at it and around it and we didn’t see tracks going in it anywhere, or where even deer or anything had walked up to it. I believe there are six circles. The barley was laying down. It wasn’t broke. It was laying down, really flat, it wasn’t sticking up. Although there was a sunflower stalk in the middle sticking up. I don’t know what causes it. WERE THE PLANTS LAID DOWN CIRCLING IN ANY PARTICULAR DIRECTION THAT YOU REMEMBER? Yes, they were all clockwise. And there is like four circles in a straight line and then two off the side of that. But the paths that go to the other circles were about 2 feet wide, they were laid down before the outside circles. Because we looked at it and the barley where the straight patches were was laying underneath the stuff that was twisted clockwise. OH, I SEE WHAT YOU MEAN, THAT THE CORRIDORS WERE LAID DOWN UNDERNEATH THE CLOCKWISE LAID CIRCLES ON TOP OF THEM. HAD ANY OF YOU HEARD ANYTHING UNUSUAL LEADING UP TO AUGUST 11? 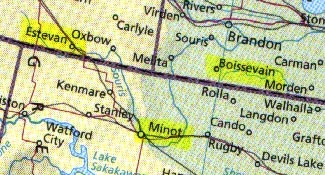 Geographic triangular pattern of crop formations: Minot, North Dakota, Boissevain, Manitoba, and Canada’s longtime crop formation hotspot, Estevan, Saskatchewan. Not very far north of Minot, North Dakota over the border into Canada is Estevan, Saskatchewan – a Canadian hot spot for crop formations over the years. In fact, on August 15th, a circle was found at Steelman, Saskatchewan and today, a dumbbell of two circles connected by a pathway was reported in wheat in Boissevain, Manitoba. 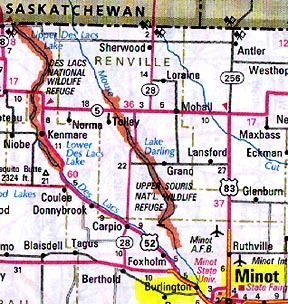 Paul Anderson, Director of the Canadian Crop Circle Network (CCCRN), points out that on a map Minot, North Dakota, Boissevain, Manitoba and Steelman, Saskatchewan form a near-perfect triangle not far from Estevan. I asked Paul today about the sudden stop of crop formations in the world since August 10th, except for Minot and Canada. Paul Anderson, Director, Canadian Crop Circle Research Network, Vancouver, British Columbia, Canada: “I went looking through all the different archives I have for all these different countries, even for ones in Poland and Switzerland and countries like that, and I can’t find any reports of any country that I could find any way for after the 9th or 10th of August… We were still getting them after that date. We were getting reports almost every day. So, I’m not certain what to make of that. LET’S TALK A LITTLE BIT ABOUT THE FACT THAT IN CANADA DURING THIS TIME THAT EVERYTHING SEEMED TO STOP IN ENGLAND SO SURPRISINGLY AFTER AUGUST 10, BUT KEPT GOING IN ENGLAND, THAT YOU HAVE HAD SOME VERY LARGE PATTERNS THAT HAVE BEEN VERY SIMILAR TO PICTOGRAMS IN ENGLAND EARLIER IN THE 1990S. Yes. It was surprising. A couple ­ two formations in particular in Ontario were quite similar to the early pictogram type formations in England, which is something that we talked about before. So that was kind of an interesting start to the year, of course. And then as we got into Saskatchewan later in August, there was that large formation just over 400 feet in length near that tiny outpost of Revenue, Saskatchewan, which is just west of Saskatoon. And that one from the aerial photographs looked gorgeous. For a Canadian one in particular, the geometry looks very good. And it was huge! Longer than a football field and the geometry was something we haven’t seen before either. But again similar to early pictograms in Europe. 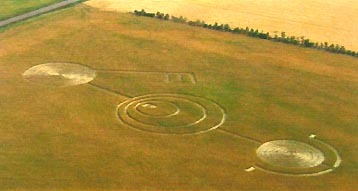 Large pictogram measured at 439 feet in length reported in Revenue, Saskatchewan on August 8, 2003 in wheat. Aerial photograph © 2003 by Brent Latumus. Section of downed and standing wheat plants in Revenue, Saskatchewan formation. Ground photograph © 2003 by Dennis Eklund, CCCRN. COULD YOU GO OVER SOME OF THE DIMENSIONS AGAIN IN TERMS OF THE LENGTH AND SOME OF THE OTHER MEASUREMENTS THAT HAVE BEEN MADE? The overall length was just over 439 feet. One of the components that was kind of unusual were the nested rings. That’s something we haven’t seen before ­ three thin rings nested together like concentric, but offset. So, they are like heavy toward one side, kind of like a warped bull’s eye. That’s something we haven’t seen before. The whole formation was something we haven’t seen before. And there have been reports since that one. But that one is still the largest ­ I think it is the largest on record in Canada. DID ANYONE ANYWHERE AROUND THAT REVENUE FORMATION REPORT ANYTHING UNUSUAL IN THE SKY DAY OR NIGHT, OR SOUND? The only thing I did hear was that the farmer reported that his dog was acting up about the time they think it happened. As you know, that’s something we hear quite commonly. WHEN PEOPLE INVESTIGATED THE BIG PICTOGRAM AT REVENUE, DID THEY FIND ANYTHING UNUSUAL IN THE PLANTS? In terms of lay patterns, the lay itself was pretty standard, not too complex with multiple layering or things like that. What was found by our coordinator and her assistant ­ they found quite a few stalks that were bent at 90 degrees at some of the nodes. 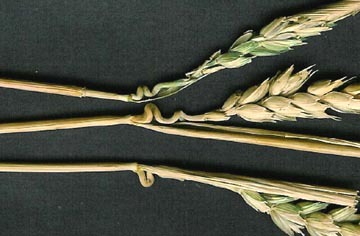 Somatic developmental abnormalities in looping and twisted stems between seed head and first growth node found throughout the Revenue, Saskatchewan wheat formation reported on August 8, 2003. Photograph by Dennis Eklund, CCCRN. But they also did find the twisted stem affect where the stem as you talked about before, twisted, almost knotted, just below the seed head. They did find quite a few of those in the Revenue formation. I find that is quite interesting. I THINK THAT IS EXTREMELY SIGNIFICANT BECAUSE BIOPHYSICIST W. C. LEVENGOOD SAYS YOU COULD NOT HAVE THAT KIND OF SOMATIC CHANGE UNLESS THERE HAD BEEN ENERGY INTERACTING WITH THOSE CELLS A FEW WEEKS BEFORE THE FORMATION. Previous PostPrevious No Ancient Oceans On Mars? Only Glaciers?